I got a chance to try out several very cool independent pattern brands recently as part of the Perfect Pattern Parcel tour, and I chose first the pretty Ava top (or dress) from Victory Patterns! Because who doesn't love a good peplum top? I'm a big fan of the peplum sewing project - a lot like sewing a dress, but takes less fabric and is more versatile to wear when it's done! As you'll see in my previous peplum variations, I normally do natural waisted shapes. But the past couple years I've seen some lovely drop-waisted and higher-waisted ones as well, which are a little more casual so even easier to wear! So when I got a chance to try out one of the patterns in Perfect Pattern Parcel #1, I definitely wanted to do the Ava dress/top by Victory Patterns. Three versions, all very cute, but the peplum version (sleeveless, this time) was perfect for me to try out! 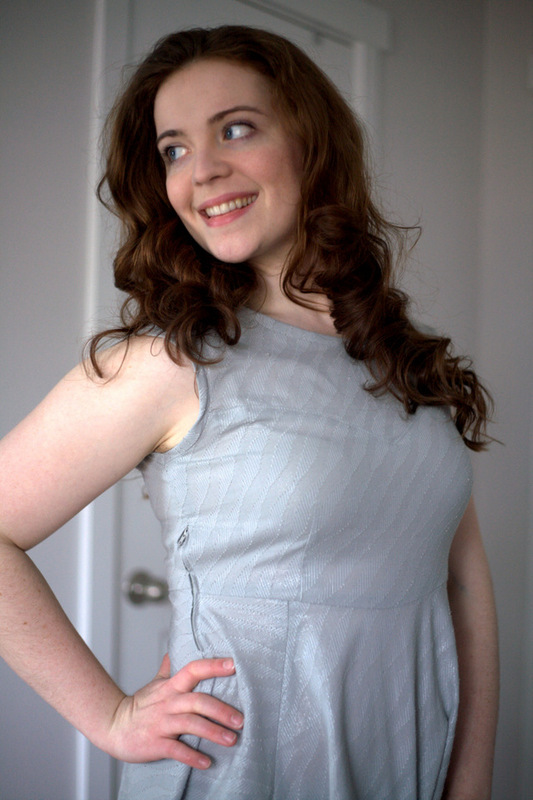 I've seen the Ava pattern around many times, but never tried any of Victory Patterns' patterns, so it was quite a treat to download the PDF, enjoy the cute graphics, print out the sheets, tape them together while watching New Girl, and cut out my top. I used some shimmery grey cotton my mom got by the bolt and gave me some of. It's lightweight and has a texture woven in, too--I like the added interest while still a versatile basic. I think this top would totally work with a dark or white jean jacket and bib necklace! I love the simplicity of the pattern (no lining, just a few pieces in the version I made) and the hidden side zipper rather than center back. I think next time I use it I'll make a different size - the one I cut out was too big so I had to take in the side seams and add a center back dart, but the straps are still a little wider than might be cutest, and those are harder to change. Put together two entrepreneurial makers driven by their internal voices and one self-taught hacker with an "if you build it, they will come" mentality, and Perfect Pattern Parcel was born. We are passionate about supporting independent designers in their craft and fostering a community of makers to grow. Our mission is to offer high-quality PDF sewing patterns written by indie designers while supporting children's education. The patterns sold in the Perfect Pattern Parcel support Donors Choose, an organization that matches up the needs of teachers and their students for specific projects with willing donors. The patterns for sale in each parcel are made by independent designers and bloggers like many of our friends out there! Independent designers create patterns that are innovative, imaginative and in line with current style trends. Their patterns encompass a broad range of sizes and fabulous “out of the envelope” fit because they're thoroughly tested by real people. With detailed and well-explained instructions, these patterns often teach as you sew. Independent designers are approachable, providing support, suggestions, publishing additions to your favorite designs, and hosting interactive sewing events. When we are patrons of indie designers, we are supporting small, mostly women owned, businesses. We are developing the community around us. We are helping to making dream come true. Phew, that was a packed post! 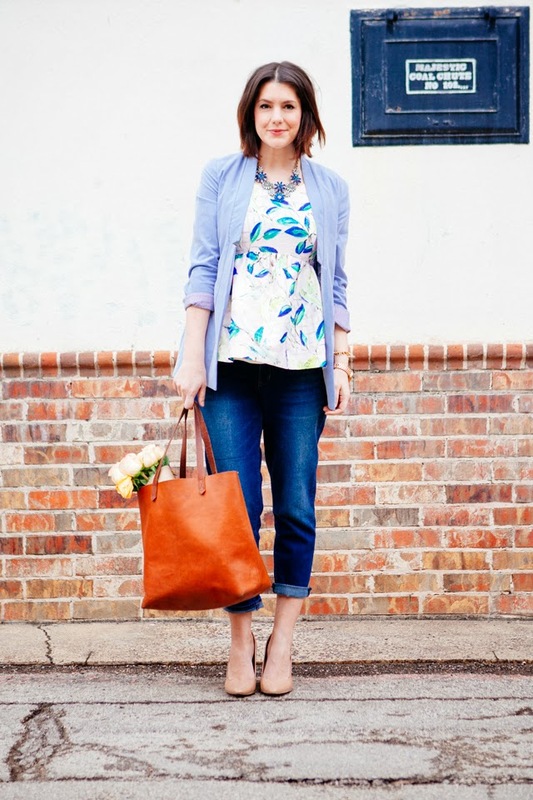 Have you tried a different waistline on a peplum top? Do you have more experience than I do with PDF patterns? ;) Any tips?? To start, you don't have to pay less than retail price for the Parcel. Heck, you can even pay more than retail for these fabulous patterns to show your support. While it seems like the structure might not be supportive, it really is. Customers are being much more supportive with their dollars than most assume for starters. The sale is also built upon the premise that for a limited time, these designers are choosing "five fast pennies" rather than a "slow nickle." In selling more patterns for a price lower than their normal retail price, they are getting their brand names out to customers that might have ever heard of them under their non- Pattern Parcel pricing. These customers can then sew up the patterns and share them on their blogs increasing the number of people who will now know these designers and build their full price sales following a Parcel sale. Thanks Jill! That really helped. I wanted to make sure I understood the process before buying so I could feel positive my purchase was a wise one. I didn't know about two of the designers previously, so just in terms of "spreading the word" the Parcel is already working without me buying anything! No problem, Emily. Are there any other questions you have? We tried to make the Pattern Parcel site as clear and easy to use as possible, but if you need more help I'd be happy to walk you through it. Also, if you do decide to support the designers in sharing the Parcel, I'd love it if you tagged us in it or emailed me the link so we can continue to foster a community that loves indie designers. Love peplum top! 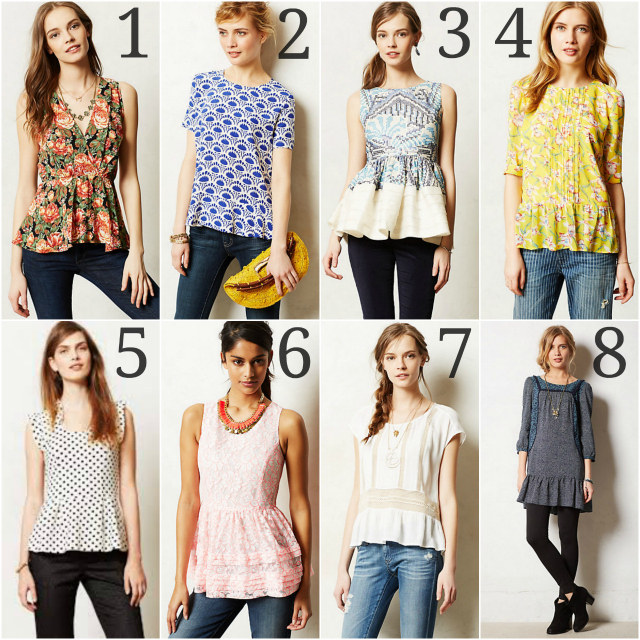 My favourite is the Anthropologie number 8 in your photomontage. I really like a drop waist and with the added peplum = Fabulous! Great job!! I have a question for you! I bought the pattern a couple of months ago and haven't made anything with it yet. That might be because the neckline looked a little challenging, with the sweetheart and having to pivot and all. You did awesome in this case, any tips? It was a little challenging!! I took the seam out and re-did it once. The second time I pinned through just a couple threads at the very center front before I started sewing at the side, and that worked well. The pattern instructions tell you to snip 3/8" of the main body at the center/point, which seemed a little risky but worked for me! Love your peplum - really really cute. I also like that its a little looser than most peplums - until my belly is flatter, I love loose options.